Cast iron pans (and a hungry man) are an upside-down cake’s best friend. 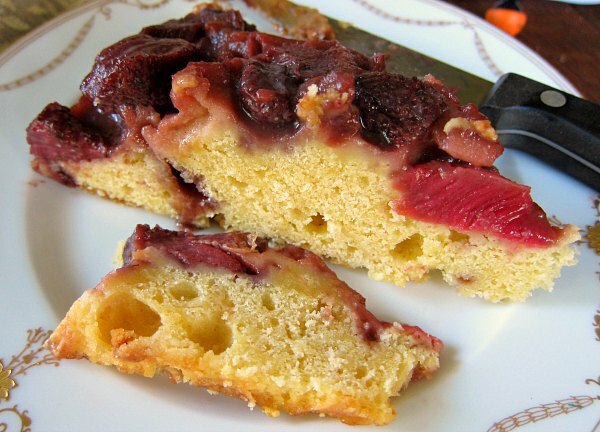 Like movies I could watch over and over again, or books I’m happy to revisit regularly, I rarely tire of certain seasonal recipes; in this case strawberry-rhubarb upside-down cake. Bathing the fruit in a little brown sugar butter. Coming off a long winter and a dwindling larder, I’m eager to return to the garden for a few early and promising harvests. Rhubarb never disappoints, though homegrown strawberries are a bit more hit and miss, and may require a trip to the organic produce aisle (at least for a couple more weeks). My kitchen ceiling will one day cave in under the weight of hanging cast iron cookware, but it’s what I like to cook with, and the perfect vehicle for a recipe calling to both cook fruit and bake a batter. Cast iron pans relying on brass hooks, and no doubt wondering when I’ll repaint the kitchen. Give the cake a little time to cool down a bit, after removing it from the oven. When the pan is still warm, top it with a plate that completely covers the pan and then some. Hold the plate firmly to the pan with both hands and flip the pan upside down. The cake eases out of the cast iron pan and onto the serving plate, and the fruit bottom sees daylight as the crowning glory of the cake. Rich, dense buttery cake crowned with strawberries and rhubarb; what’s not to like? You can make the cake as thick or as thin as you like based on the size frying pan you use. 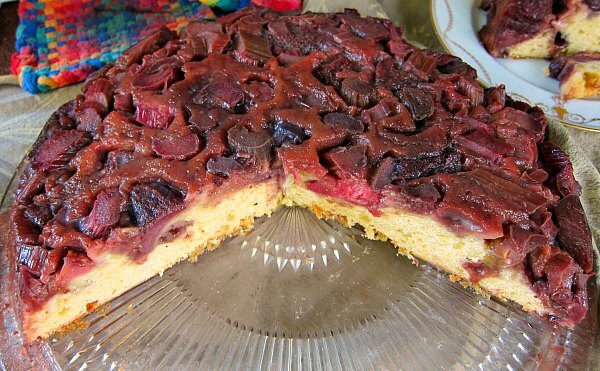 The upside-down cake pictured above came out of a 12-inch cast iron frying pan. A 10-inch cast iron pan works wonderfully too, just makes a taller cake and thicker fruit top. 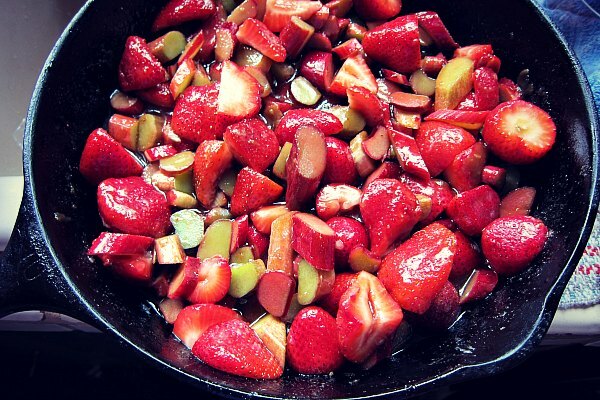 Garden fresh rhubarb and strawberries combine to make an amazing upside cake, which starts in a frying pan. The juicy, gooey fruit bottom becomes the top when you flip the warm pan. The only that makes it better is a big dollop of whipped cream or ice cream. This recipe was adapted from one seen in The New York Times, 5/20/2011. Sift flour, baking powder, and salt together in bowl, set aside. On low heat, in a cast iron frying pan (10 - 12" works fine), simmer brown sugar and 1/4 Cup of butter for 2 minutes while whisking to incorporate; remove from heat. Whip 2 sticks of room temperature butter until fluffy, about 2 minutes. Add one cup of sugar, and zest of one lemon. Cream until smooth, about 4 minutes. Add vanilla extract, then add eggs, one at a time, mix well. Add sour cream and lemon juice, mix well. On low speed, add all of flour mixture 1/4 Cup at a time. Add fruit mixture to the warm frying pan, coating fruit with brown sugar, butter mixture. Pour batter on top of it, and smooth it out. Place frying pan in oven at 325 F. Bake for approximately one hour or until a toothpick comes out clean. Remove from oven, cool for at least 15 minutes, and flip over onto large serving plate. Oh heck. We have to wait a month longer than you in the Land of Mild Green Winters for rhubarb, and of course strawbs take even longer. But I see a strawberry-rhubarb upside-down cake in my future. FYI I’m sure your cast iron cookware is happy to see the light of day. Mine huddles below the counters on a creaking-from-the-weight lazy susan (who was susan? was she really lazy? I’ve always wondered), their comfy black heft hidden until called out for …….. dessert! Who knew?! My favorite cast iron item of all time was a humongous skillet I inherited for the summer at a USFS guard station in the early ’70’s. I was a newly married and enthusiastic young cook, but no way could I ever fill that baby. She was at least 18″ across, and I named her Beulah. Sadly, I was so honest that I left her there when we moved back to town in the fall. I wonder if she’s still there? She weighed a ton, and I could hardly lift her with both hands, empty, so not very practical. But still ….. my fantasies of cooking in a logging camp were piqued by her girth and ample proportions. Wow, think of the upside-down cakes I could have baked!!!! And now to copy off your recipe and await the arrival of the red fruits. Great stories Kathy, and I have a cast iron pan that is just as big, though I need spotters to help me lift it into the oven. I swear it’s the same size as a manhole cover. (Now measuring it) Stop the presses, my biggest cast iron pan is only 15″ across. So all hail to Beulah the biggest pan in the west, may she fry on forever in a forest service cabin of her choosing! Eileen, I know what you mean about the coziness of ancestral cast iron. I have a wee little skillet that belonged to my mom, perfect for frying one or two eggs. Tom, I do wonder if Beulah survived in its FS cabin home. My husband was a seasonal fire ranger, and I don’t think they even have those anymore. I think fire crews are mostly or all contracted now. I spent a few happy summers far from a paved road, mostly alone in the cabins by day as my sweetheart was out patrolling, keeping the forest safe. Caught up on my reading, wrote poetry, and one summer, practice piano on a rental upright (we were only 40 miles from Bend that year). And cooked up a storm. Propane lights, stove and frig, big old smelly diesel generator for electricity at night, and a hand-crank party line phone (tied to other guard stations on the forest) to call in the weather readings at noon. Single wire line too long and scratchy-sounding during any kind of bad weather to make it useful for any other calls. Long before cell phones. Mice in the mattress, porcupines chewing on the plywood siding and car tires, and scorpions behind the refrigerator in the kitchen. My other favorite gargantuan tool was a massive galvanized metal bucket and mop wringer, with a gigantic string mop to go with it. A great life. I wonder if anyone is lucky enough to still be leading it? OK, now out to my normal kitchen to fry some eggs in mom’s pan. 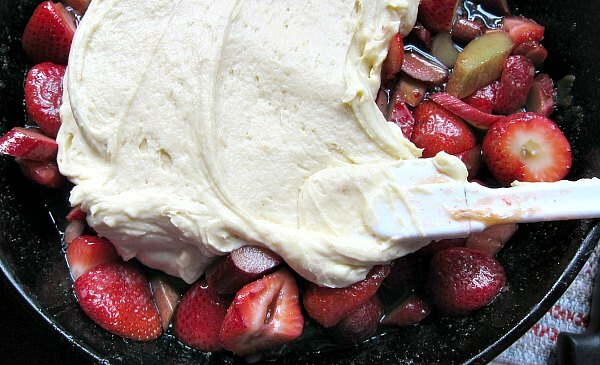 Thanks for the recipe again, I am heading out to the store for OG strawbs and rhubarb (the best I can do for now). Another rhubarb recipe! We are into our 4th day of relentless rains, with a high of 38˚ predicted (! 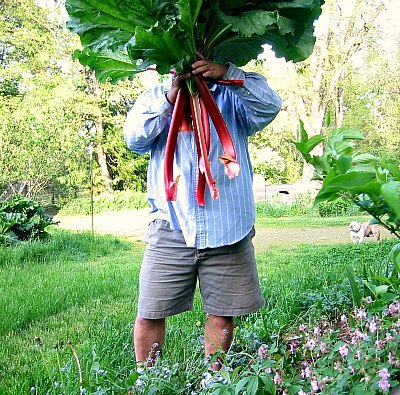 ), but my rhubarb continues to become larger and I have high hopes of baking with it soon. A slice of this upside-down cake slathered with whipped, heavy cream would be my breakfast, if possible. I can only dream. 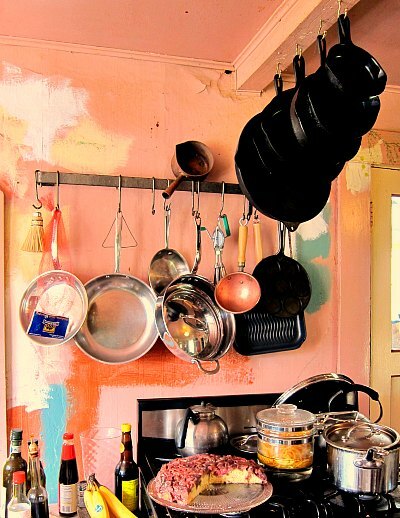 And all of those cast iron pans, hanging in a row, make me smile. They are my pans of choice and I treasure the ones I inherited from my mother and aunt. But none of mine exceed 10-inches. I need your 12-inch to round out my collection. Eileen, for some strange reason, it’s going to be around 70 degrees today — woo-whoooo! So I’m spending the day tending (weeding and pruning) the raspberry patch and whacking back the blackberry brambles. Now as for this cake, I really like how dense it is. I think most upside-down cake recipes phone it in, but this one makes a really great stand-alone cake. I love Kathy G.’s missive-I want to read the book! Every time I lift my cast iron Dutch Oven, especially when full and hot, I say “This is heavier than a dead priest!” as my mother did who was a staunch Catholic. Rhubarb is not ready here (ND) can’t wait! I got my cast iron and a set of La Creuset cookware when a good friend past on. I tried to talk her daughters into taking them but they were not into the cooking life. That was 25 years ago I wonder if they have ever realized what they gave away! I half expect them to return someday and say give it up! I forwarded your lovely recipe to a friend, who made it with great success last night, and even shared a piece with me. Delicious! Just wanted you to know that your quantity for cornstarch is missing from your ingredients list. Thanks Michael, yikes…I’m so sorry. Sometimes I need supervision, my friend. I have finally made friends w/ my cast iron skillet, it’s take some time for me to enjoy it and season it properly (I still have to use a little soapy water to wash it….I just have to). 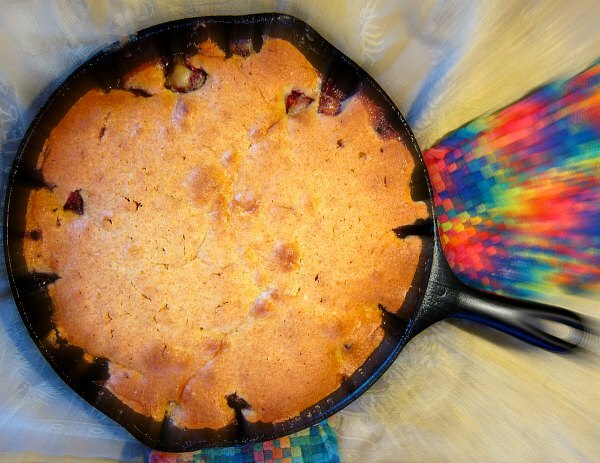 I hope I can still find some rhubarb, because I must make this gorgeous skillet cake for Memorial Day weekend! I didnt have any strawberries but i used fresh blackberries. I didnt get to try it yet but it looks real good. Oh good, I use blackberries too and they are delicious in the recipe. The cake turned out great it was really good.